Rebonded hair are the new fashion fad. From the top actresses to models to working professionals, women in every area are getting their hair permanently straightened. Well, we know they look great on you and add grace in your look and personality. However, are you aware about the repercussions of permanent hair straightening? Do you know it can leave you bald, if not done in the right manner? Do you know it can leave your soft and long hair damaged for the rest of your life? Are you aware of the high quantity of chemicals used in the straightening agents? Is there any side effects of hair rebonding? Yes, hair straightening and rebonding has some threatening side effects. And if you are planning to go for this procedure, we insist that you make yourself aware of its disadvantages so that you can decide on your own for your betterment! Permanent hair straightening means that your tresses would be exposed to a huge amount of chemicals and dryers that would not be drying just your strands; they would also result in drying up your hair roots. This makes you vulnerable to hair loss and you hair become brittle thus easily break off. If exposed to extended heat procedures then soon after the treatment is over, your single hair strand will start falling. In the next few days, you might lose patches of hair. To ensure the good effects of hair rebonding and save quality of your long locks, get it done only at a professional salon. If you are fortunate enough not to fall a victim to hair fall, be prepared to deal with another adverse effect of hair rebonding. It is burnt, damaged hair. Extensive use of straightening chemicals cause burning of the hair strands and leave them look messy and unhealthy. It might take a lot of time to do treatment for damaged hair from rebonding, your hair look shiny and healthy again. This would not only mean a great deal of efforts and innumerable herbal treatments. Cause of permanent hair loss! The excessive use of dryers and blowers could cause cuticle damage which means permanent loss of hair. The success rate of your rebonding exercise largely depends on how the process has been carried out and the right usage of chemicals or protective compounds. Take services of a professional and experienced beautician who is well-versed with the elaborated process of hair straightening. A novice beautician could really make things messier for you and leave you with irreparable hair damage. Know the symptoms of permanent hair loss, this is certainly means everlasting hair loss as once the hair cuticle is affected, the hair root is damaged thus the re-growth of your tresses stops. You might be left bald and embarrassed forever! Therefore, carry out an extensive research on the salon and its services where you plan to go for rebonding. Talk to their previous customers, if you could find any and safeguard yourself against the side effects of hair straightening. Split ends- deal with them now to stop hair loss! A smaller problem when compared to the first three side effects of hair rebonding explained above in the article. However, it still indicates poor health of your tresses. The primary cause of split ends is the use of harsh chemicals on your soft and sensitive hair during the session of straightening. Split ends mean brittle hair and a stopped hair growth. Moreover, they are one of the reasons why women end up losing hair on a daily basis. To get rid of them, you can go for split end removal sessions and try to give natural therapies to your hair to encourage their healthy growth. The question must be answered here –what type of hair loss is permanent? It is important to understand that any process which uses chemicals at length interferes with the natural processes of our body. Therefore, straightening agents pose a danger for the health of your tresses and may end up modifying their natural texture. The damage could be everlasting and in grim cases, it could be irreparable as well. You might regain the lost hair but might not get their shine back. They would probably become hard and easily breakable. No treatment would be effective enough to work on the lost colour and texture of your hair. Thus ensure the quality of the hair care products being used for your straightening process. High exposure to heat and cosmetics could means allergies such as itchiness of the scalp, scalp allergies such as eruptions and blisters on the head. This could be extremely painful and difficult to treat. If you are vulnerable to allergies, check the hair care products used in the procedure before you go for it. Have a detailed discussion with the beautician and clear all your doubts. Try to understand the procedure you would be put through and weigh its pros and cons. 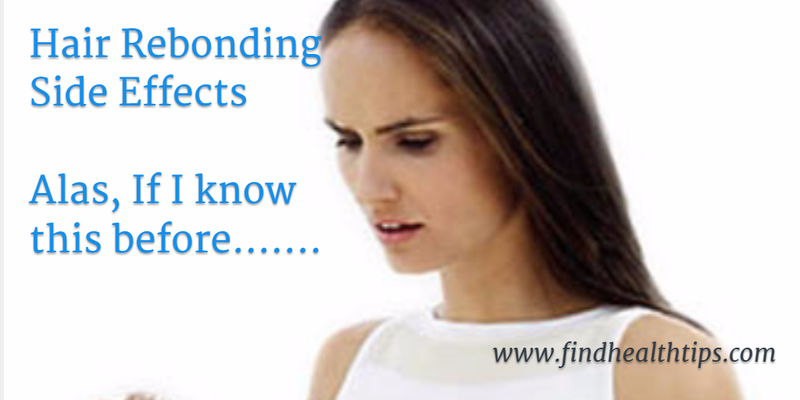 The side effects of hair rebonding could truly be a cause of great mess. If the procedure to get your hair straightened overdone, then you might not be left with hair at all! Yes, it could be that serious thus you need to know the right way of getting this hair treatment done. Only visit a salon with an experienced and certified hair dresser. Go through the product range they might be applying to your hair. Check some videos on YouTube to see how this procedure is done by the professionals so you are armed with enough knowledge before you go through it. Last but not the least, it would be great if you could just stick to the home remedies or natural ways of straightening your hair. It involves no chemicals therefore, your hair are safe from the dangerous effects of hair rebonding. It is possible to manage your curls at home and make them straight. You just require right guidance which is available on the internet.